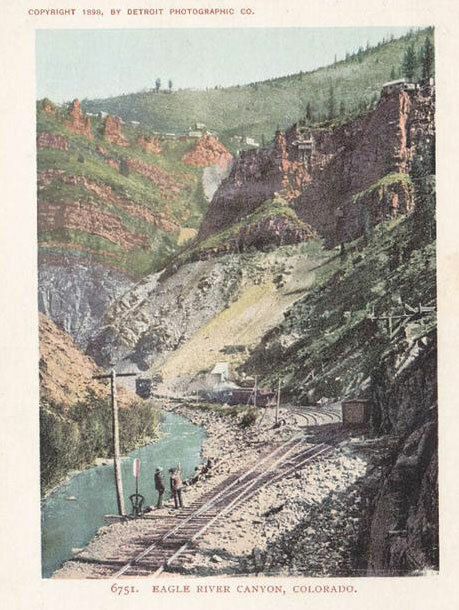 Sometimes the Eagle County Historical Society receives some unexpected treasures, like this vintage postcard rendering of the mines in Eagle River Canyon, circa 1890 – 1900. The Detroit Photography Company created the postcard by color-tinting a photo taken by William Henry Jackson. The Ben Butler mine, one of Eagle County’s biggest gold producers, is visible among the sharply-pointed rocks in the upper right edge of the photo. Many thanks to post card collector Alvin Schaut of Plainfield, Wisc., who discovered the card and sent it to us.